The commercial domestic species of red oak are widely distributed throughout the United States. The heartwood and sapwood of red oak are similar in appearance, which is light-colored with a reddish tone. The grain of red oak is open, and also somewhat coarser, and so more porous, than that of white oak, which tends to have longer rays. Depending on whether the wood is plainsawn, riftsawn, or quartersawn, the grain of red oak can have a plumed or flared appearance, a lighter grain pattern with low figuring, or a “flake” pattern that is referred to as “tiger rays” or “butterflies.” Red oak boards can show a pronounced variation in appearance, depending on subspecies group, origin, growing season, and other factors. 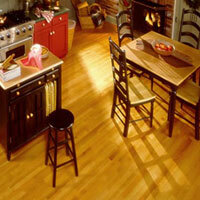 Red oak is notably stiff and dense, has high shock resistance, and resists wear. 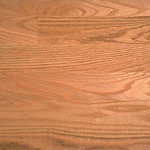 Red oak has a ranking of 1290 (compared to that of white oak, which is 1360). Red oak has good resistance to splitting and excellent holding ability. Red oak sands better than white; by contrast, white oak has better machining qualities. Because of its relatively high porosity and low concentration of tannin, red oak works better for bleached floors than white oak. Oak is practically synonymous with high-quality, durable, and distinctively attractive wood floors. In addition, it is widely used in shipbuilding, furniture and veneers, kegs and casks, truck and trailer beds, caskets, paneling, and mining timbers. Oak also makes a nice-burning fuel wood, and it yields tannin for the formulation of dyes.